This morning we prepared to walk and then rode with Emmie to the Cathedral Market. After walking around there and seeing the wares, we rode to Cream & Sugar for some coffee with Emmie. 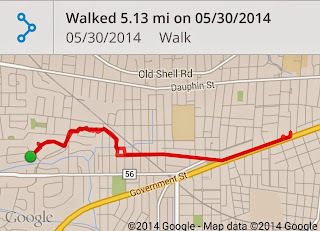 We walked home, taking a somewhat circuitous route to add mileage. Once we made it to Carlen Street we decided to walk around the Murphy campus, talking about when our oldest two children went to high school there. Glen surprised me by singing the Murphy High School Alma Mater, or what he could remember of it. It's a wonder we remembered any of it after all these years since Marie and Noah went to school there. 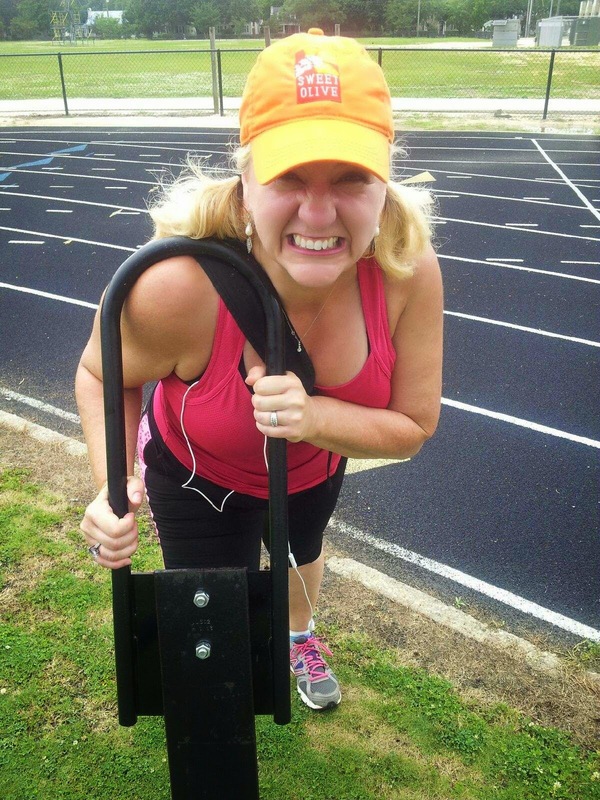 While at Murphy we stopped on the track so Glen could get a picture of me "pushing" one of the sleds. He plans to show it to our friend John, who played football at Murphy and ended up being a football coach. As we were walking around the school campus, we noticed an angry cloud bank brewing. We stopped for a few seconds to decide which direction it was going. It was to the east of us (and we were headed west) and moving NE. We only experienced a few slight sprinklings when we made it to Emogene Street. I was actually hoping for more of a pouring because I was pretty hot by that time. This is one of the few times we have walked this distance without some type of break in the middle. It wasn't difficult at all, but we did drink 2 1/2 bottles of water between the two of us. With a weather forecast for the whole weekend of rain and an afternoon funeral to do, the main issue of walking today was when we could possibly do it. Glen was watching the weather closely and saw we might have an opportunity to walk late in the morning. As we started out, we thought we might have a chance of being rained on, but looking at the skies it didn't seem likely. . .the sun was out, there were few clouds and the sky was a brilliant blue. We started out through the neighborhoods, and everywhere was the evidence of the storms over the last few days. Puddles and ponds had popped up where once were streets and sidewalks. Nothing presented itself, however, that we could not go around. We walked along Government Street past Catherine and then turned around to head home. By the time we had turned around, the clouds had come in and the sky darkened. We had a few sprinkles to walk through but nothing more. Once we came in there was just enough time to get ready for Ms. Anne's funeral. Once again the clouds disappeared for her funeral and graveside service. We realized we hadn't eaten a thing all day, so we left the funeral home in search of lunch. By the time we got home, the dark clouds were building up again. Hopefully, there will be another bright spot later on where we can pick up a few more miles for the day. The local forecast has been for rain from Tuesday through the weekend. Yesterday I woke up early to walk before work. We got dressed and walked out the door, determined to walk even though it was lightly raining. We had just walked out to the driveway when there was a big clap of thunder. I don't mind walking in the rain, but I am NOT going to walk in lightening and thunder. So no walk yesterday. It didn't look like we were going to be able to walk today because we had the same forecast. In fact, it stormed all last night. But by five o'clock we had a window of opportunity, even though the sky was still very cloudy. The temperature was nice and even though it has been rainy, it wasn't too humid. There was a nice breeze most of the time we walked. 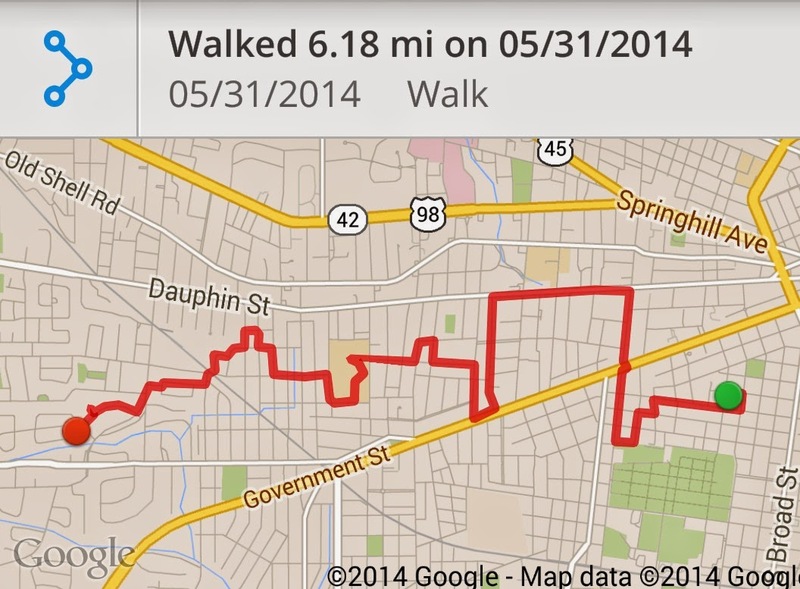 We followed the neighborhoods to Ashland Place and then walked back. Our route for today's walk. I am disappointed I won't meet my mileage goal for the month, but the days leading up to Emmie's graduation along with the inclement weather gave us more no-days and short days than I expected. 84°/ Feels Like 90° 66% humidity. 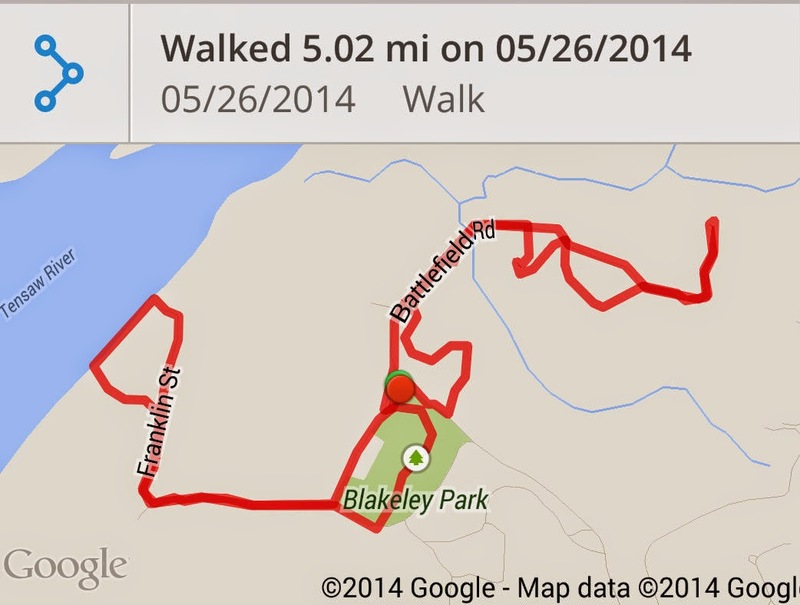 Today we walked at Blakely Park. It seemed fitting that on Memorial Day we walked the battlefields of the last battle of the Civil War. It was hard to imagine soldiers hunkered down in the breastworks, or dying in the very spots where we were walking. It took us a little bit to find a place to park. 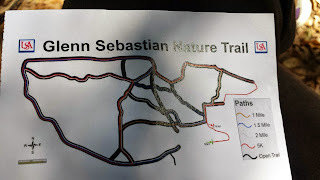 The trails were poorly marked and the map didn't seem to readily correspond to what we saw on the ground. We just started out on something that looked like a trail and we made it to the battlefield, the Confederate Breastworks and the Union Breastworks. This trail just seemed to loop around so when we came to a fork in the road, we took another direction. I knew one trail led down to Blakely river but I couldn't get our bearings with the paper map they gave us when we came into the park. I looked at our map on May-My-Walk and followed the trail down to the river by watching our progress on the screen of my phone. 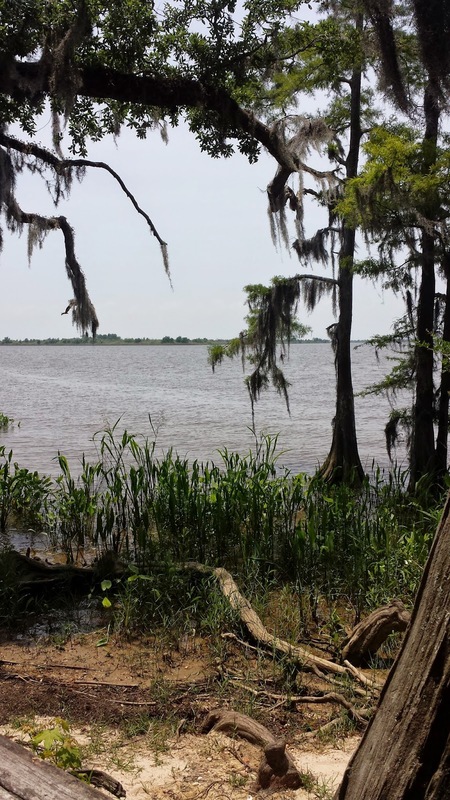 There was a nice boardwalk along the river and we followed this to the end. It made a big loop back to the main trail we followed down to the river. At first the walk seemed very pleasant, warm but not hot. Then suddenly I felt as if I was on fire. I was pouring sweat and I felt as if I was walking through mud. I wondered if maybe my blood sugar was low because I hadn't really eaten much before we left. I remembered Glen had packed some sweet ice tea in our bag. A few slugs of that and in a few minutes I felt much better. It stayed hot to me, although Glen said he didn't feel hot at all. But then he is much more heat-acclimated than I am. I was surprised at the bugs we encountered. They were vicious and relentless. I don't think I have ever sprayed bug spray on my face before, but they were trying to get in my nose, mouth and ears. Several times I was bitten through my pants, so I sprayed my clothes as well. When we first started, the trail was full of tiny frogs. . .just heads and feet, they didn't seem to have any bodies. They jumped around so fast when we walked by, I hope we didn't step on any. I also saw several salamanders which were definitely more afraid of us than us of them. While walking to the river, Glen spotted a snake in the road, but it had been run over so it was of no threat. 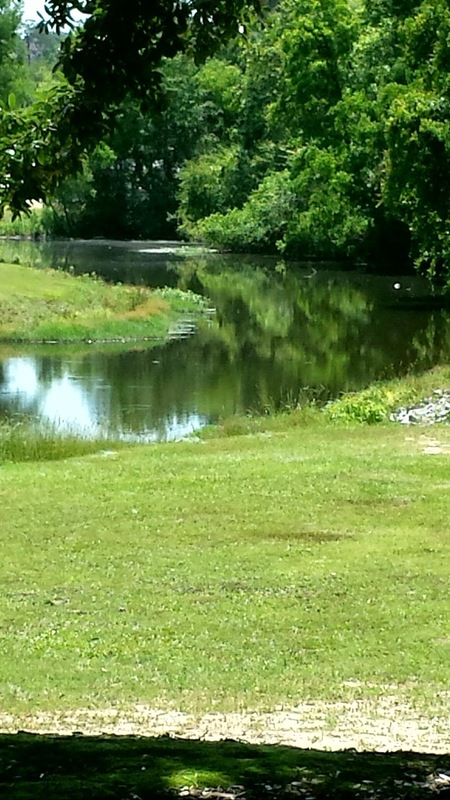 I looked for snakes, especially along the river, but didn't see any. 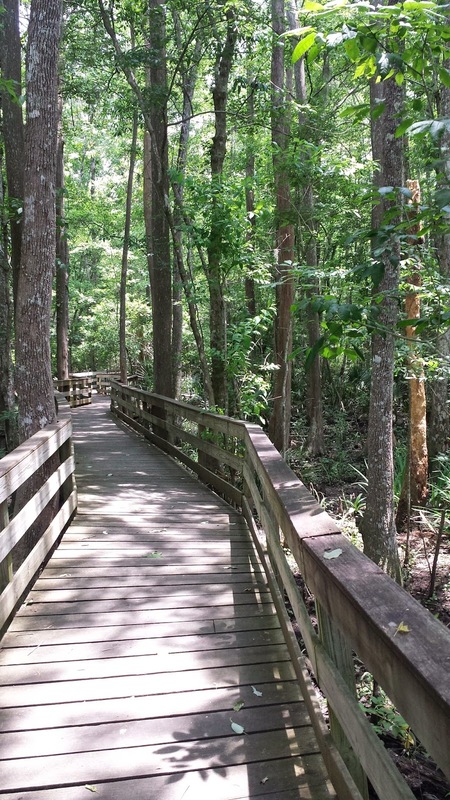 I am looking forward to walking here again, especially since we will be more familiar with the trails and the layout of the park. Tonight seemed like a hard walk to me. Maybe because I struggled with a migraine most of the day, maybe because it was late and we already have had a full day. We walked down Government Street to Ann Street and then circled back home. Even though it was hot, there was a nice breeze blowing. It was also nice that it was later and the sun was already dipping beneath the trees. I can't imagine how hot it would have been if the sun was high in the sky. I guess it's good we got any walk in, much less 6+ miles. We headed out to walk and realized we only had a little time before our grandson Jackson's baseball game. We barely made it out of the neighborhood well before it was time to turn around and come back. 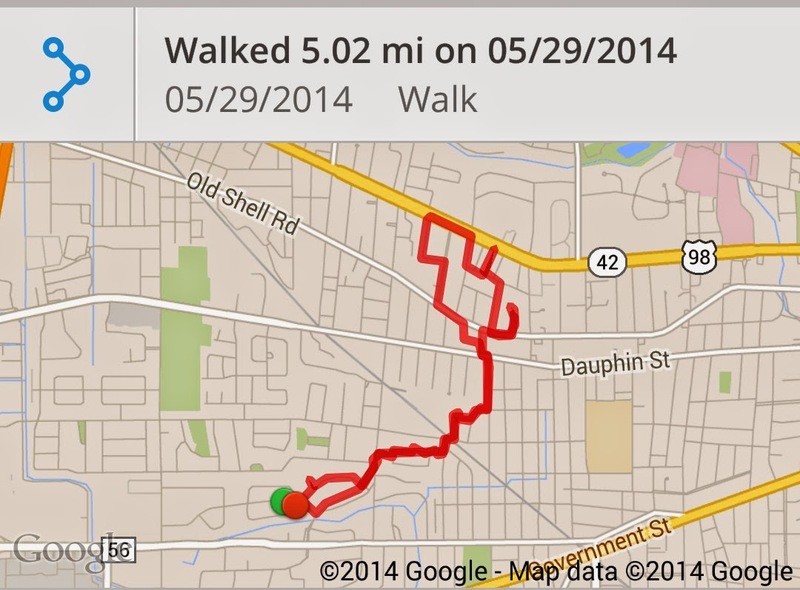 We only had a small amount of time to walk after church. I was also still on departmental call, so we stayed close to the house. Sundays never offer us much time to walk. It would be impossible to walk early in the morning before we leave to go to Sunday School at St. Elmo Bible Church (where Glen teaches.) Once we finish there, we head to Gordon Oaks Healthcare Facility where we have Chapel services. After that it is time to prepare for our afternoon Bible Study. 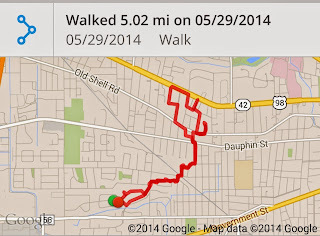 The only time we actually have to walk on Sundays is in the evening before dark, so it is always a low-mileage day. Today we finally found the nature trails at USA. 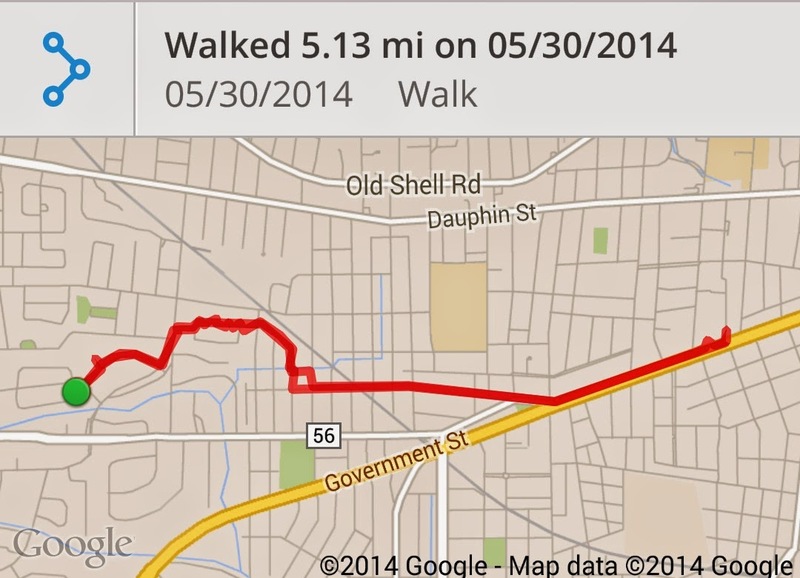 I believe we walked almost all of them because they are short...I think the longest is 3.1 miles. I didn't like these trails as much as the mountain bike trails because I thought they felt less isolated. Glen said he liked them more because they "were prettier." 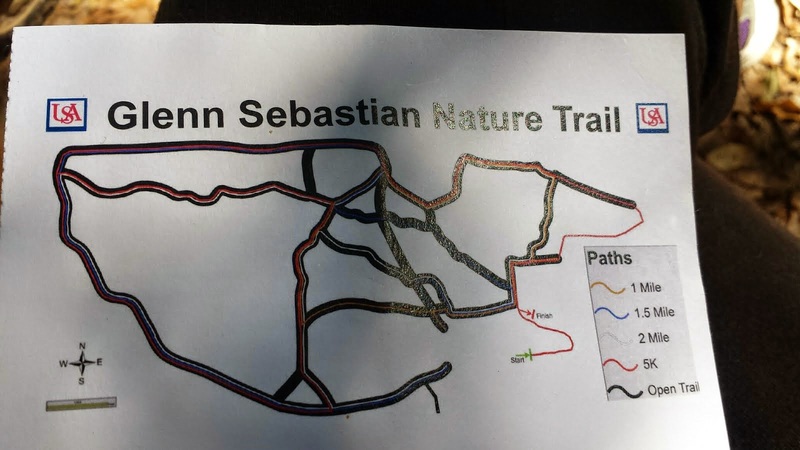 They are not as well marked as the Mountain Bike trails, although there are "Your are here" maps scattered along the paths. The weather was great, it was only hot the times we were out in the sun. The mosquitoes are beginning to come out and we must start bringing repellent with us from now on. I worked last night, so we didn't get to walk until late. I was also on departmental call and it was busy in the unit, so we had to stay close to the house because if they called me, I would have to be there within thirty minutes. We haven't walked in the neighborhood for a long time, and it felt strange. I was slow and dragging, partly because I was recovering from a migraine and partly from sleeping fitfully during the day. Today we walked on the streets again. 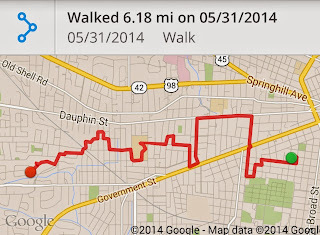 We went through the neighborhoods, down to Government Street, across Broad Street to Augusta. We followed Augusta to Washington Square. Washington Square is a lovely place in our city. It is graced by old oak trees, has a fountain in the center and always seems to be beautiful. The only drawback is the lack of seats. There is one concrete bench in the park. We decided to use the park as our snack place and found an oak tree with huge roots. We sat on those roots to eat our snacks. After a short rest, we headed home. The walk home was really hot. . . my face is beet red but it was a good walk. Today was a new adventure. 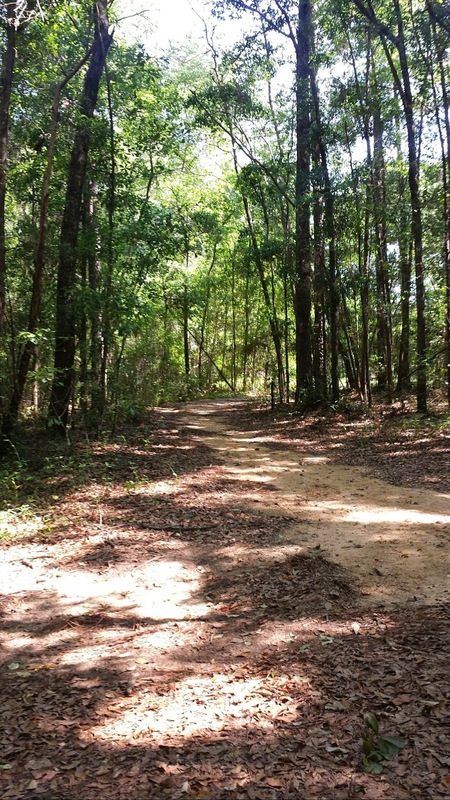 We walked on the University of South Alabama mountain bike trails. These trails totally separate you from the outside world. Once you enter there is nothing but trees and the path. We had to be very careful where we stepped because of all the roots crossing the path. Several times I tripped on one and was hurled faster down the path than I intended. Overall, I really enjoyed the experience. It was so different from walking on the streets and I was surprised at how it felt isolated from the city just a short bit away. The trails are very well marked completing 12 miles. When it is time to leave, the exits are exceptionally well marked as well. I thought it was a great experience.